Hamilton Pope cast a big shadow in a small town — and in the life of a Guthville, Illinois, expatriate who followed his career goals to a Chicago suburb. When Pope dies, his funeral at a small Baptist church gives the man an opportunity at midlife to reflect on the nature of family, community, friendship and more. 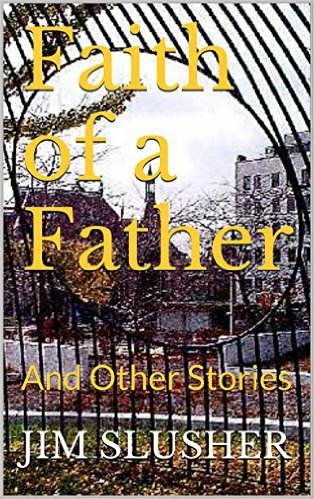 The narrative is one of a diverse collection of tales in Faith of a Father and Other Stories, available in e-book on amazon.com, including a father’s life-changing confrontation with the meaning of religious faith, a heart-stopping adventure for a mayfly swarm on a country pond, an orphaned teenager’s encounter with justice and more. I heard about Hamilton’s death in much the same way I had heard about his illness. From a roundabout source and nearly too late. An inauspicious ring in the meat-hours of a Sunday night announced the call. It was my father. “Oh, no.” They are the only two words I know to say at such times. Dad worries about the effects of age showing, and I can hear the worry in his voice. But he is not old. He is not yet 69. Fact is, he talks about the effects showing more than they actually show. Perhaps that’s one effect. Maybe I still could make it, I say. Guthville is only two and a half hours south of Chicago. If I left early, I could make the service and maybe even be back at the office by mid-afternoon. It hurts, badly, to consider what not making it says about the state my life has come to: that I am so pre-occupied with the fragile components of mid-life that I cannot make time to honor the solid foundations of youth. Donnie — well, everyone calls him Don now — sounded the same lament a month or so earlier. He had heard from his mom that Hamilton, whom we had known as a broad-chested bear of a man, was suffering from some sort of kidney problem, had lost a hundred pounds and was barely getting around with a walker. What has happened to us, Don wondered, that we have to learn these things from our parents in vague, passing conversations? Hamilton’s son Robert — okay, he prefers Rob now — was one of my best friends growing up. He still is as far as I’m concerned, though I have seen him only a couple of times in the past 10 years. So, for that matter, is Don, whom I talk to but a few times a year despite the fact that he lives closer to me now than when I used to ride my horse across the muddy corn stubble to his family’s farm on lazy fall weekends. Hamilton was the inaugural half of the phrase HamiltonandCharlene, You rarely heard Rob’s parents referred to any other way. They raised Rob and his two older sisters in a horizontal ranch-style home they built in the 1960s with a big picture window and gray aluminum siding at the end of a road that hooked out to the north of Guthville proper and, for all practical purposes, tailed into their garage. This road, a furlong of blacktop lined on both sides by one-story ranch homes, is what passes for a subdivision in Guthville. At the far end was Guthville Grade School, the four-room schoolhouse on the northwest corner of town that the village’s children attended until 1969, when buses began taking the fifth-, sixth-, seventh- and eighth-graders to “middle school” in Myriqua, seven miles north. Across the street from Rob’s garage, behind the row of his neighbors’ homes, was corn, mile after square mile of corn, whose seasonal swells and crests ensured constantly changing, if predictable, vistas across the flat prairie. And many people did. The house was a constant hubbub of competing conversations — Robert and his friends, Robert’s two older sisters and their friends, his Grandpa Crossman, who lived a couple blocks away but was always around to recount tales from his own youth in “I-o-way,” the younger children that Charlene watched while their parents ran the local grocery store, the neighborhood kids who just dropped in to play, or the neighbors who stopped by for a joke, some advice or, honest, a cup of sugar. The atmosphere was charged with a kind of intergenerational social anarchy. HamiltonandCharlene did not preside over it so much as host it, and if you wondered how they could stand it, you would not be alone. I cannot imagine its like today. Oh, you see a little of it at Chuck E. Cheese on a Sunday afternoon or maybe at a sports bar on game day, but those gatherings always focus on a particular age or interest and they’re temporary. The mayhem at HamiltonandCharlene’s featured all demographics — indeed given that the Popes sometimes hosted missionaries or foreigners associated with the church, it sometimes introduced rarely seen browns and blacks into the village’s universally white pigmentation — and it seemed to be a permanent condition. Yet, not only did Rob’s parents not mind all the constant noise and activity, they seemed to relish it. Nearly all my images of HamiltonandCharlene are of laughter and smiles. It would be a gross exaggeration to describe them as a second mother and father, but in the context of the village it takes to raise a child, they certainly figured prominently. Charlene was always happy to see me and ever ready to laugh at my jokes, however stupid or contrived. Hamilton at various times was Scout leader, Sunday School teacher, chauffeur, auto mechanic, entertainer and, as I think of him, disciplinarian, although I find it hard to remember ever seeing so much as a scowl cross his face. He was a man who lived with his sleeves rolled up, and I mean you to picture that both literally and figuratively. He had strong hands, thick forearms, large, round shoulders and a profuse chest that was quick to erupt in spasms of husky laughter. He was blue-collar and small-town. He had strong opinions and clear values, but he wasn’t inclined to impose either on you. He let his views show in his day-to-day actions. He was, I suppose, like most of us, certainly like most of the villagers who helped raise me, just an average guy. But he was a guy worth remembering. I resolved to make the service. I drove to Guthville alone. The kids had school and my wife never met HamiltonandCharlene. She barely knows Rob. She couldn’t have shared my mood, might not even understand it. I’m not sure I did — do? — myself, for that matter. All I knew was that I was satisfied to be by myself. The skies were bilious gray as I coursed down the interstate highway, a path now more familiar and way more common for me than those that used to take us teenagers through the Timberline woods or down to the banks of the Mackinaw River. I’m tempted to read some divine symbolism in the early-spring gloom, some sign that God was sorry to have taken Hamilton Pope from the world, but I realize that would be nothing more than melodramatic pretense. Why, after all, should God make the whole world suffer just because of one man’s death? And aren’t people, even good people, buried in all climates? Despite my Baptist upbringing, I’ve come to realize that God does not critique the lives of the dear departed through the weather. No, the leaden canopy overhead and the barren landscape all around were the products of nothing more than the millennial interplay of geological forces and the more recent collaboration of cold fronts, wind velocities and the earth’s proximity to the sun. Still, it was remarkable how the atmospheric conditions reflected and deepened my mood. I had no heart for music. I wanted to indulge in contemplation. The closing books of the Old Testament that I’d been “reading” on an audiobook, with their wails of injustice and their simultaneous prophecies of doom and rejoicing, seemed somehow fitting. I was sad but not somber. I had to admit, after all, that this little quicktrip wasn’t entirely about Hamilton. I hadn’t even seen him in years. When I knew him, he was a working man at Caterpillar Tractor Co. He retired in the late ’70s and since then, completed a second career as head of the Guthville water department. The last time I ran into him — in the hallway at Myriqua Hospital, where he had come to visit my mother during a troubled time of her own — he didn’t recognize me until I told him who I was. “My gosh. Jimmy Castle!” he had exclaimed in his husky, open-mouthed laugh. I was 47 years old.